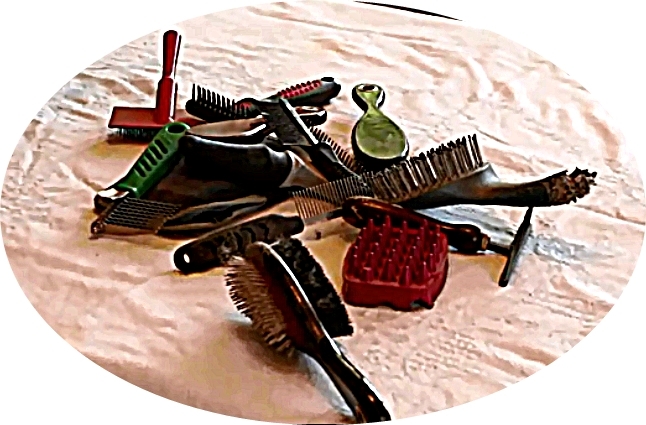 Does your collection of useless grooming tools look like this? Are you still trying to find a tool that works and your pets don’t hate? If your pet loves ear scratches and belly rubs, your search is over! RescueRake™ is the grooming tool that will allow you to gently, quickly, and painlessly go through your pet’s coat on a daily basis and remove any debris plus the loose and dead coat. For long, medium, curly, dense, and double coats, finally you will be able to get all the way through the coat and down to the skin. You can now catch anything before problems develop without scrapping, scratching, cutting or irritating the skin. Using the ergonomic RescueRake™ is easy on your wrist too! NEW RescueRake™ for short coats! RescueRake™ is the grooming tool for your pet that is as gentle and effective as combing your own hair and should become part of the daily once over that veterinarians recommend.. Forget about all the tools that require you to put razor sharp blades against your pet and cut out or rip out piles of dead hair. You know your pet hates it and you feel awful too. And then there is all that mess to clean up! Rather than chasing after your pet for a stressful session for both of you, watch him come running as soon as you pick up the RescueRake™because he knows it’s time for you to give him gentle caresses and your undivided attention. Designed and manufactured in the USA using hospital grade aluminum, steel, and sanoprene rubber from recycled sources whenever possible, the RescueRake™stands up to disinfectant soaps or Barbicide washing after washing. Especially important when used in a shelter, groomer, or vet facility. Dry after washing as pins will rust if left wet. Why call it RescueRake™? The goal is not only to improve the health of pets with frequent grooming, but give a boost to our own economy by our manufacturing, marketing, and order fulfillment procedures. The tool is entirely made in the USA by out of work union toolmakers. The materials are hospital quality while coming from suppliers known to recycle for their new materials. Marketing via the Internet and YouTube with local people providing skilled services. Someone who has to work from home will do order fulfillment at a fair wage. The packaging will be minimal, adding as little as possible to our landfills. Shipping methods will be as environmentally smart as possible. 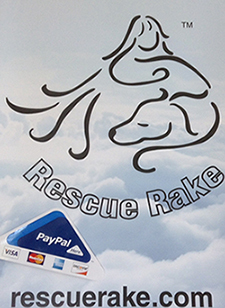 Rescue groups and Clubs are sent one RescueRake for every 7 purchased by their supporters. Effective January 27, 2019, Postage increases from $7.25 to $8.00. If you place your order by January 25, you will be charged the old rate of $7.25.